I love Foundation Brewing and buy as much Epiphany as I can so when they released Afterglow as a single IPA in cans I had to get some. Afterglow pours a bright relatively clear orange with a thick white head. Aroma is more herbal and floral than Epiphany but still hop forward. Taste switches it up with a lot more citrus and tropical than I expected from the nose. A nice sweet base and relatively bitter finish make this an easy to drink single IPA. Everything I have tried from Foundation has been top notch, Epiphany takes the top billing from Foundation but all of their beers are worth trying. 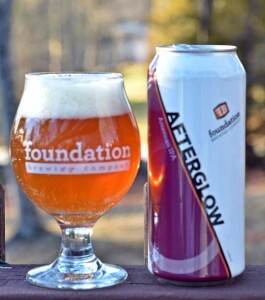 Brewer’s Description: Afterglow is an American IPA, rich in West Coast and South Pacific hop flavors and aroma. The juicy malt base enhances the notes of tangerine, pine, and berries from the hops. It finishes with a pleasingly dank and firm bitterness.